This is the second interview with Dr. Kenneth Pelletier. I invited Dr. Pelletier back, because he is the author of many great book on health and wellness. In particular he seminal work entitled ” Mind as Healer, Mind as Slayer” peaked my interest, and I thought my listeners would enjoy learning more from Dr. Pelletier. 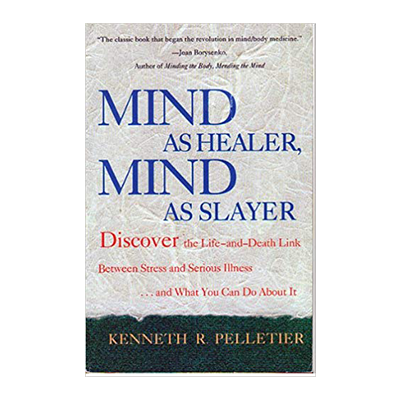 While “Mind as Healer, Mind as Slayer” is not a new book, it’s content is ageless. Today researchers and physicians know more about the links between stress and many of our modern day illnesses such as cardiovascular disease, cancer, arthritis, inflammation, diabetes. In my interview with Ken we discuss the links between our health and mental imagery. We all know that what we “think about and dwell on” has a tremendous impact on our physical health. Negative thoughts can create a direct biochemical impact on our physical body that manifest into stress, then that stress causes our system to produce cortisol, and too much cortisol does have a negative impact on our vascular system and the release of excessive cholesterol. Practicing stress-reduction techniques such as meditation and biofeedback is a great step forward in the prevention of psychosomatic disease. While there are many types of meditation, in the Eastern tradition the meditator works toward a psychological state which is termed as transcendental awareness or satori. There are two basic methods by which this state is achieved: 1) restriction or focusing on attention on an object of meditation or 2) opening of attention, in which the meditator places himself or herself in a state of undistracted receptivity to external and internal stimuli. Meditation is one of the very simple way for people in our modern world to reduce stress, and to shift our focus on the negative to one of neutral or positive. Stress play such an important role, and controlling our thoughts is one of the best ways to reduce stress. If you want to learn more about Dr. Kenneth Pelletier and his books, talks and lectures an what he advocates to reduce stress please visit his website by clicking here. I hope you enjoy this great interview with Dr. Kenneth Pelletier.